The current large-scale literacy assessments in place in Ontario schools, which are based on a static rather than dynamic model of learning, only provide a fraction of information about what students know and can do. 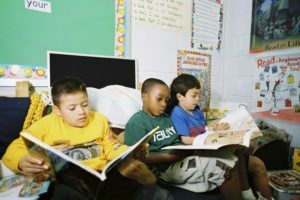 There is a critical need for 21st century assessment models that can gather data on broader areas of student learning, including students’ ability to take up and synthesize new information, their abilities to “think about thinking” (metacognition), their engagement with the subject matter, their ability to communicate competently in an online interface, and their capacity for self-regulation. BALANCE! will assess the literacy skills that are foundational in Ontario schools today and provide scaffolded intervention in areas of metacognition and self-regulated learning skills to support students’ literacy development. Our project is expected to contribute to significant improvement in student learning outcomes as measured by provincial achievement assessments and standardized cognitive measures. Individual students will be provided with comprehensive profiles that can be shared and tracked over time, and differentiated instruction can be tailored to their needs. This can lead to significant reduction in the costs for purchasing commercial measures and training teachers for implementation. Equally importantly, it will contribute to improved student engagement with positive experiences with assessment, while strengthening students’ self-regulation.